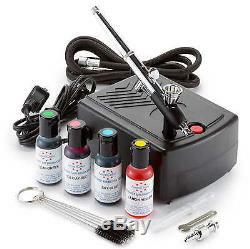 Cake Decorating Airbrush Kit - 4 Color Set. Perfect for all levels from novice to professional. Ideal for cake decorating, temporary tattoos, nail art, and other thinly-painted crafts. Includes a premium, dual-action, internal-mix airbrush perfect for detailed work. The airbrush's solvent-resistant needle packing is safe to use with all airbrush mediums, including food application and body art. Set comes with four bottles of high-pigment AmeriMist Air Brush Food Coloring. USA-made, 100% gluten-free, Certified Kosher colors are highly concentrated to provide superior coverage on hard-to-color, non-dary whipped toppings, buttercream icings and other decorative edibles. Included professional-grade airbrush compressor quietly delivers consistent air pressure for even results. The oil-free compressor design makes this set-up perfect for nail art, food decorating, body art and all other standard airbrushing applications. Airbrush connects to the compressor with an included 6 foot nylon air hose. 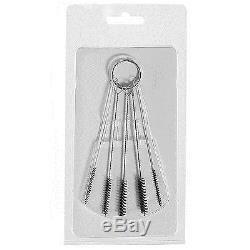 Five wire brushes are included for quick and easy cleaning when you're done with your work. Premium dual-action, internal mix airbrush. Precision-crafted body provides a balanced feel in the hand. Tight-tolerance head provides extremely fine atomization with razor-sharp detail. Needle backstop at the rear of the airbrush allows you to pre-set the trigger travel, producing consistent line widths. Includes pre-installed 0.2mm nozzle (tip), nozzle cap, needle, and removable needle cap for a spray pattern between hairline and 3/4 (20mm). Fine-finish, stainless-steel needle minimizes tip-dry. Gravity-feed 2cc color cup won't obstruct your view during fine detail work. Solvent-resistant needle packing allows safe use with all types of spraying mediums. Uses standard 1/8 BSP air hose fittings. Ultra compact airbrush compressor is designed for quiet operation. Oil-less, maintenance-free design is ideal for tattooing, cake decorating, nail art, or thinly-painted crafts. Features one airbrush holder on compressor top. Delivers up to 25 PSI (0.4 CFM) of consistent air flow. Maintenance-free, CE certified and thermally-protected. Uses standard 1/8 BSP male outlet to connect to air hose. 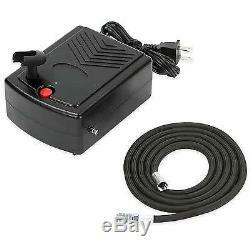 Operates on 12V DC power (AC adapter provided). Dimensions: 4.5" long, 4" wide, 2 tall. Designed for intermittent use (30 minutes of operation followed by a 15-minute cool down). Not suitable for use with siphon-feed (suction) airbrushes. Includes a nylon air hose with standard 1/8 BSP fittings. High-pigment AmeriMist Air Brush Food Coloring. Premium AmeriColor AmeriMist airbrush food coloring. Ideal for food decoration and cake design. Superior coverage, even on hard-to-color, non-dairy whipped toppings and icings. Prevents water spots and icing breakdown by eliminating the need to over-apply. Non-toxic, highly concentrated color is produced in a facility with no tree nuts or peanuts. Made in USA, 100% gluten-free, and Certified Kosher. The following colors are included. Holiday Red, Leaf Green, Lemon Yellow, and Sky Blue. 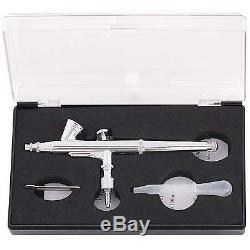 1 premium dual-action, internal-mix airbrush with pre-installed 0.2mm nozzle set. 1 ultra compact, oil-free air compressor. 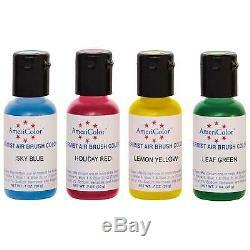 4 bottles of AmeriMist Americolor Air Brush Food Coloring (0.65 ounces each). 1 six foot nylon air hose. The item "Cake Decorating Airbrush Kit 4 Color Set" is in sale since Tuesday, July 07, 2015. This item is in the category "Home & Garden\Kitchen, Dining & Bar\Cake, Candy & Pastry Tools\Cake Decorating Supplies". The seller is "professionalemporium" and is located in Fort Lauderdale, FL. This item can be shipped to United States, to Canada, to United Kingdom, DK, RO, SK, BG, CZ, FI, HU, LV, LT, MT, EE, to Australia, GR, PT, CY, SI, to Japan, to China, SE, KR, ID, to Taiwan, ZA, TH, to Belgium, to France, to Hong Kong, to Ireland, to Netherlands, PL, to Spain, to Italy, to Germany, to Austria, RU, IL, to Mexico, to New Zealand, PH, SG, to Switzerland, NO, SA, UA, AE, QA, KW, BH, HR, MY, TR, BR, CL, CO, CR, DO, PA, TT, GT, SV, HN, JM.